Freesat's sat-nav system manages a spot of karaoke too. That attractive little number you see above is the latest funky satellite-navigation system to come out of South Korea, or The Home of Genuinely Practical Gadgets, as we're starting to know it. 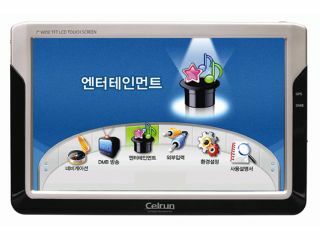 Aside from the navigation features, the FreesatCelrun FDN-3700 is really a mini media centre powered by a 520MHz Intel PXA270 CPU and an undisclosed version of Windows Mobile. There's 4GB of internal flash memory and a CompactFlash slot for storing all those newly legal BitTorrented movies you've downloaded. Naturally, a device like this can also turn its hand to gaming and the one thing that defines humanity so well - karaoke. It also supports the TPEG protocol the delivers over-the-air traffic information and updated maps are available to download for free. No word on the price yet but it's likely to cost around £750 when it appears in March.